I was recently offered the opportunity to try the Adovia Dead Sea Salt Scrub from Go Pure Naturals. This plastic tub of fine Dead Sea salt, oils and herbal extracts comes together to exfoliate and hydrate the skin and leave it feeling soft and smooth. What is in it? Lay thine eyes upon the field in which they grow their ingredients and see what hath been planted. Yeah. I've only had one cup of coffee, so far. Please don't judge me too harshly. Okay. Let's get to the meat of the matter. After I get another cup of coffee because damn. My brain, she is not working so hot, ya know? 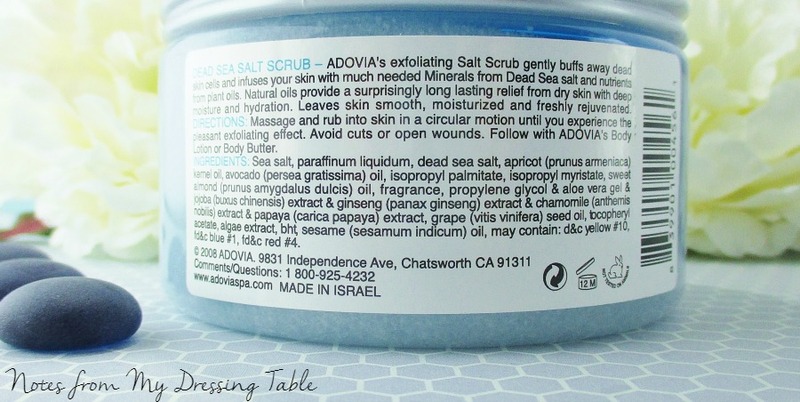 Adovia Dead Sea Salt Scrub is a very oily scrub. I don't know if you can tell from my photograph but there is almost a quarter of an inch of oil pooled on the surface. Giving this scrub a good stir or shake only temporarily gets it all mixed together before it quickly settles to this state. Now I don't object to this, really. I have very dry skin so as far as I'm concerned, the more oil, the merrier. I don't know how the abundance of oil would play in the shower, as I haven't used it there. I'll go into why, shortly. This scrub performs like a boss. Stir it together and pick up a nice amount and go to it. Scrub vigorously, rinse with nice, warm water and pat dry. 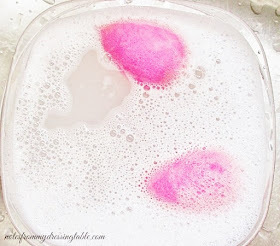 Soft, velvety smooth skin that feels nicely hydrated. I initially tested this, as I always test all scrubs on my hands. They are the perfect place, as I need regular exfoliation there and my hands can get very dry. I was happy with how this scrub did it's job. I was not, however happy with the scent. This scrub has a powerful, artificial oceanic fragrance. When I initially opened it and gave it a quick sniff, I quite liked it. It smelled watery, fresh, clean without that "swampy" undertone that some oceanic scents can have. I stuck this under my husband's beak and he liked it, as well. My opinion about the scent changed when I was photographing and testing this scrub. The longer it was open, under my lights and my nose, the stronger the scent became and it started to really bug me. But I thought, it's because it was under warm lights. It will be okay just scrubbing and rinsing off, right? Yeah. No. I did my scrub my hands test. Liked how my hands felt but the scent. No. It over powered and lingered. For hours. I am not kidding. For hours. Now, if it turns out that you love this scent, that is fine. But since this is one of those rare instances in which a product scent just isn't for me, personally that characteristic turned out to be one that I didn't appreciate. 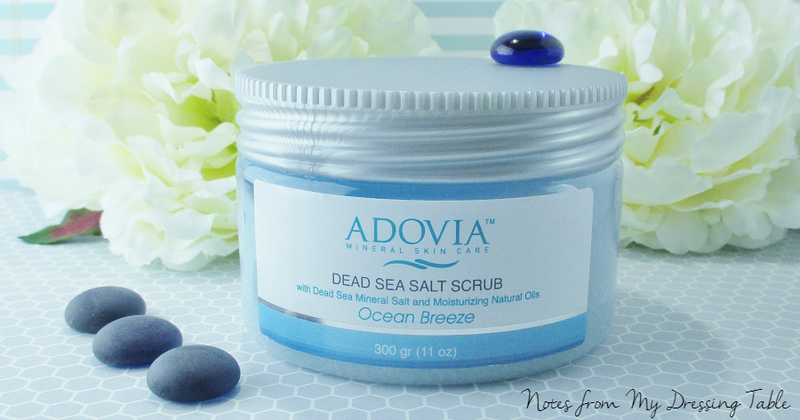 Bottom line, Adovia Dead Sea Salt Scrub, $15.95 is a good quality product that does it's job admirably well but the scent is one that you need to be able to appreciate. It is not a "bad" scent. It is just not to my personal taste and for that lone reason, I won't be using this all over my bod. 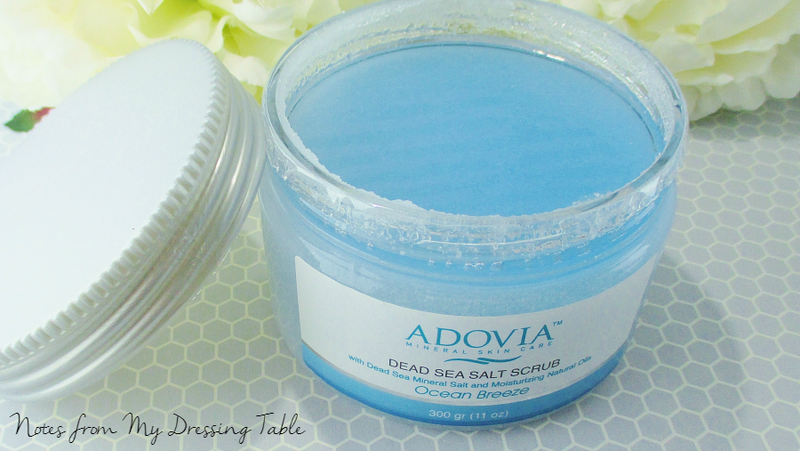 You can find the Adovia Dead Sea Salt Scrub on Amazon. I would like to try other products from the Go Pure Naturals line. Have you tried this scrub? What did you think of it. of the way it performed and the scent? I'm interested to hear your experience. You know what, girl? I found that it's the oily scrubs that make my skin feel the best, and sounds like this one was fantastic! I would not have been happy with the chemical scent either. Great, honest review. You're right, if the scent was your preference, you'd love that it lasts for hours. Maybe it is something to use right before bed? I heard about the oiliness of this scrub (I don't want to have to mix it in the shower) in another review, so that coupled with the not so great scent would probably keep me away. Too bad because Adovia usually has good products. I haven't tried this scrub but the scent would bother me. The oiliness would turn me off... not sure the scent has anything going for it, either haha! I want a polish that color! It sounds a bit too oily to deal with in the shower, but I bet it would be wonderful applied to dry feet that were then washed in a basin or bowl. I just don't like an oily mess left on the bottom of my shower. Hmmm, too bad about the scent. I don't think I would like it. I really like scrubs as well, but if the scent is off, it makes me less likely to use it. Nice review on this. IT sounds lovely but I want my stuff to smell good so this probably would be something I would pass and not try. I'll be reviewing this next week. I actually liked the scent, but the oiliness is a little hard to maneuver in the shower at times. I choose things by the scent so this is O.U.T. for me. I've tried a few of Adovia's items and always liked them! I'm so sensitive to scents... I'd have to sniff before I buy. I don't like overly oily either... 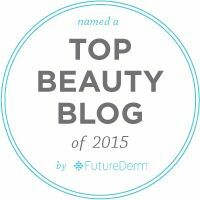 I needs a sample in a beauty box! Oy, the scent might throw me off but it might be enjoyable to me. Either way, I'm addicted to scrubs and I need to try it. I tried this last year and the scent was too much for me to handle... so like you - the product overall worked, but I had to stop using it. I like Adovia products and feel that they are really heavy duty stuff. I can be a bit sensitive to scents, I wonder if the scent might dissipate if you left the top off for a few hours? I like super scrubby and oily too, but I don't think the scent would work for me. I find a lot of ocean scents are too strong. I love 'em super scrubby and oily, too. So nice for dry skin. I usually love watery, oceanic scents but this one just didn't work for me. Honestly, I can't even countenance the idea of that scent wafting through my house. Just thinking about it... Nope. I don't think so. I feel ya! I really wanted to love this scrub! I just couldn't with that scent. I do want to try other products in this line... I have read good reviews. One of which was yours, if I remember correctly. You never know until you try it! Scent is very subjective. It does scrub like a boss! I would love to try others in the line. I have read good reviews. Yepper. I won't be using this one. And I has a sad because it really does work well. It would be great for feet, it's nice and scrubby and hydrating. I just can't with that scent so I'll pass. Right? I love that blue! I like oily! My dried out old hag hide loves it. The scent was too much for me. It's... Strong. And a unique experience. There are scrubs that smell so much better. I've read great reviews on their other products but this one was a no for me. I'd like to try other things they carry. I can't use this, at all. The scent is a no go. I wish it weren't so because it does scrub like crazy. You might like the scent... It's an individual thing. I don't mind oily, my skin likes that but yes, the scent lingers. For a long time. I would have been in heaven with this, if I could handle the scent. I have been in the Dead Sea so whatever has a name like that on it, sign me up! it sounds fabulous!